Do you support or oppose legislation that would revoke the tax-exempt status of the National Football League? 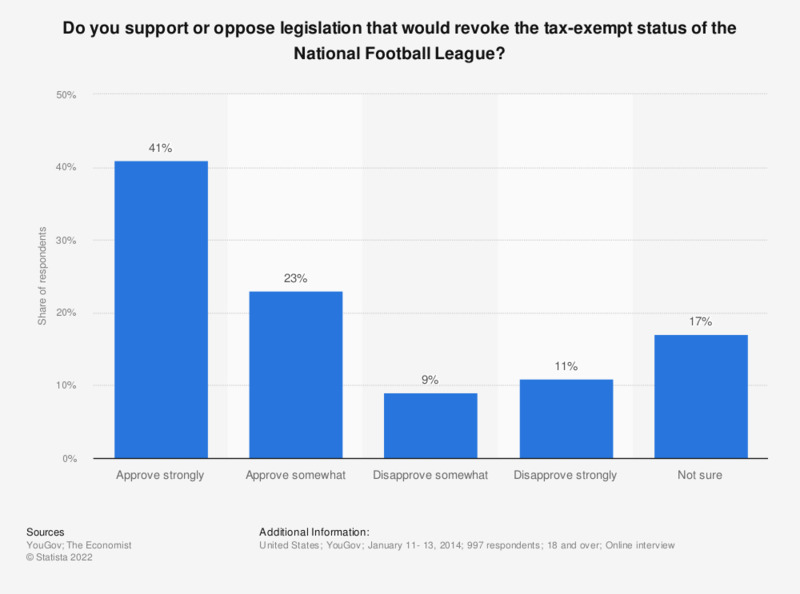 The statistic shows whether the survey respondents approve or disapprove of revoking the tax-exempt status of the National Football League. 41 percent of the respondents said that they approve strongly of revoking the tax-exempt status. How interested, or not, are you in the NFL (for example - watch on TV, listen on the radio, attend in-person, follow on internet or social media)? Which one, if any, of the following football positions do you think is the most vulnerable to injury? Do you approve or disapprove of a federal judge’s decision to overturn the four game suspension of New England Patriots Quarterback Tom Brady? Do you follow on a regular basis and/or consider yourself to be a fan of the National Football League (NFL)? Do you have a favorable or an unfavorable opinion of the National Football League?